BlackSocks.com has more than just subscription socks for men! 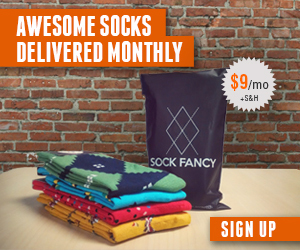 Last year, we covered BlackSocks.com, a site to get men’s subscription dress socks. Their business has evolved significantly in the last year. BlackSocks.com now offers subscription socks, subscription men’s underwear, subscription t-shirts, and subscription dress shirts. The BlackSocks.com Men’s Underwear Subscription has a variety of options. You can choose boxers, boxer briefs, boxer shorts, or regular underwear, and pick from a set of colors such as white underwear, blue underwear, or black underwear. You can also choose the material and size. Prices range between $14 and $25 depending on your selection and every four months you receive a new delivery. The BlackSocks Men’s T-Shirt Subscription also has a wide set of options to suit your needs. Choose Fine Ribbed or Stretch material, choose your size, color (white, blue, or black), and choose your cut (sleeveless, round, or v-neck). Prices range from $290 – $30 and every four months you will get a new shirt at your doorstep. Lastly, the Blacksocks Dress Shirt Subscription for Men makes it easy to keep your dress shirt collection fresh. Choose white or blue color, choose your fit (slim or regular), and your shirt size. Pricing is $83 per month for a two new shirts every four months. Have you received product from BlackSocks before? What do you think?